In the front crawl / freestyle stroke, breathing is a technique on its own that can take a while to master. This is because the head is submerged for the most part of the stroke cycle, which can be stressful for beginners. Additionally, to breathe in, you need to roll your body and coordinate the inhalation with the arm movements, which requires practice. 1) During an arm recovery with breathing, you roll more on your side than during an arm recovery without breathing. This allows your face and mouth to clear the water and so you can inhale. 2) You start inhaling as soon as your mouth clears the water at the end of the upsweep. (As a reminder, the upsweep occurs while your hand moves from below the chest toward the hip during the propulsive phase of the arm stroke). Inhalation continues during the first half of the arm recovery on the breathing side. 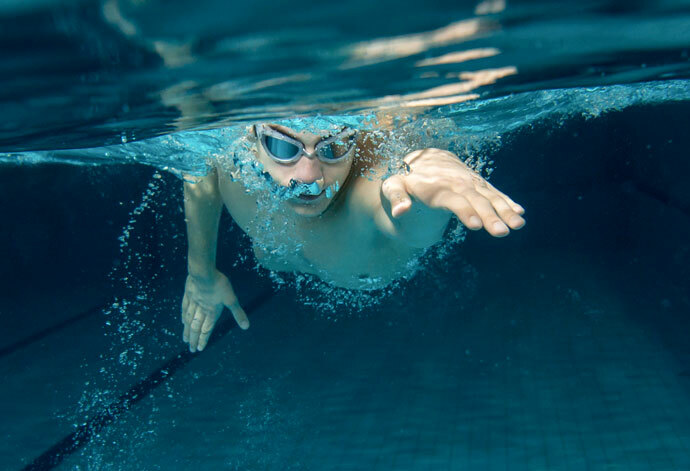 In front crawl, breathing begins as soon as the mouth clears the water. 3) The second phase of the recovery lasts from the moment your recovering hand passes the head above water to the moment it is fully extended forward underwater. During this phase, the shoulder and hence the body on the recovering side will roll downward while the other side of the body will roll upward. Your head will simply follow along, and your face will turn downward. 4) As a consequence, you should start to exhale as soon as the face turns downward again. Exhalation starts as soon as the head rolls back in the water and continues for the rest of the stroke cycle. This prevents you from getting water into your mouth and nose. You should then exhale slowly and continuously until you roll your body on the side for the next arm recovery with breathing. 5) You should forcefully expel the remaining air from your lungs while rolling on your side to breathe so that you can inhale fresh air as soon as your mouth clears the water. 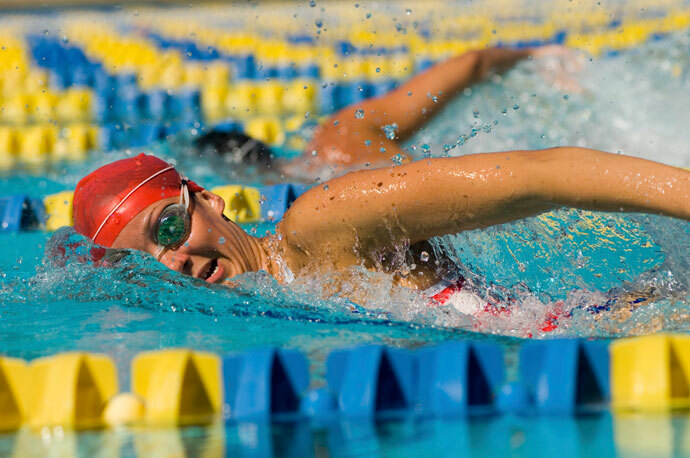 The most common breathing patterns in front crawl are unilateral breathing and bilateral breathing. In unilateral breathing, you breathe in every other arm stroke. As a consequence, you always breathe in on the same side. This gives you plenty of oxygen and is especially useful in short distance races. Your swim stroke can become lopsided however if you use this breathing pattern all the time, for example, while training. In bilateral breathing, you breathe in every third arm stroke. As a consequence, you alternate your breathing sides. This pattern is symmetrical and improves your balance as it forces you to become used to breathe on both sides. Long distance and fitness swimmers commonly use this pattern. If you want to participate in open-water swimming competitions, being able to breathe on both sides is also an advantage. You could have a fellow competitor kicking water in your face when you want to breathe, and you can work around this problem by breathing on the other side. On the other hand, if you are used to breathing on one side, and in an open water race someone is kicking water in your face on that side, breathing can be challenging. Once you have mastered unilateral and bilateral breathing, you will have no problem using other patterns as needed. For example, you can breathe in every fourth or every fifth stroke. Or you can breathe in ten times on the left side, then ten times on the right side, and so on. Or you can change your breathing side with each pool length. 1) It is important not to hold your breath but to exhale continuously while your face is turned downward in the water. This allows you to be more relaxed. 2) Furthermore, there isn’t enough time to both inhale and exhale while you are on your side and your mouth has cleared the water. As a consequence, you must exhale all the air in the water before the mouth clears the water. 3) Another problem with holding your breath while swimming is that it increases the blood pressure in your cardiovascular system. It seems that this can have negative consequences for your heart if done over the course of many years. 4) How to exhale: I begin by exhaling through both the nose and the mouth. This allows me to expel any water that might have gotten in during the inhalation. Once I have expelled all the water from my mouth, I close it and exhale for the rest of the stroke cycle through the nose. 5) Beginners often first lift their head forward before rolling on their side to breathe in. However, this causes their hips and legs to drop and should be avoided. The cause of this is lack of balance, and especially balance when floating on the side. Our swimming drills let you practice balance to correct this problem. 6) Beginners often compensate for dropping legs by kicking harder, rather than adjusting their balance. The problem with kicking harder is that you can get quickly out of breath. Improving your balance is the cure for this problem. 7) On the other hand, if you observe experienced swimmers, you’ll notice that when they breathe in, it looks as if their head rests sideways on the water surface. They don’t lift their head to breathe in. 8) Don’t initiate breathing by turning your head before rolling your body sideways. Instead, roll all your body at once and turn your head a little bit farther at the end of the roll so that your mouth can clear the water. 9) As explained earlier, it is essential to be able to breathe on both sides, so that you can adjust to any situation you might encounter, for example in a triathlon. 10) As also explained earlier, always inhaling on the same side can make your stroke asymmetrical. This, in turn, makes you less efficient and can also lead to swimming injuries, for example swimmer’s shoulder. So it is essential to learn to breathe on both sides. 11) Finally, you can experiment with a nose clip to keep water out of your nose. This way you only have to avoid getting water in your mouth. Once you can coordinate breathing with the arm movements and the roll of the body, you will be able to progressively get rid of the nose clip. 1) We have an article covering 8 drills to learn to breathe in front crawl. 2) Another option is to practice our series of drills to learn the front crawl stroke. If you complete this series of exercises, front crawl breathing should become easy for you. I am a 68 year old, male, who has been swimming recreationally for a year. Breathing seems hard when swimming, some of it is inexperience and some fear. Is it fairly common to have these issues after this much time? Will it come with practice and patience? I’m making a wild guess here, but you write about inexperience and fear while swimming. So I guess there’s tension in your body involved and maybe also shallow breathing, which could leave you out of breath quickly. Another indication for this is that you can swim farther when using a swim snorkel. So I guess relaxation is the key, and I think you are doing the right thing, doing both drills and swimming laps. I wouldn’t worry too much about it, I think over time you’ll be able to relax, build endurance and swim greater distances. I am 75 years old. I can do the breaststroke and backstroke, however, the front crawl is a disappointment. I panic, particularly in deep water and as a result, I am getting tired easily. I am now overall feeling uncomfortable in the water. Yet I am a rounded it on trips and in summer. I guess you panic in front crawl because you aren’t comfortable with having your face underwater or you haven’t mastered breathing in front crawl yet. When I swim with a buoy it seems effortless and I can swim 25 meters comfortably with two breaths. Now without the buoy swimming feels labored an I tire quickly. What do you suggest? This most likely is a horizontal balance problem, where you haven’t learn how to keep your legs up by pressing your head and chest down. Our front crawl lessons teach you this skill. I swim by front crawling in one direction down the pool and then back floating on the way back to catch my breath. I’ve done this for quite some time and haven’t been able to build up the endurance to front crawl continuously. I use a four-stroke technique, inhaling every fourth stroke and exhaling during the other three strokes. I’d like to be able to front crawl continuously. Do I just need to keep practicing, or is there something I should try to change in terms of technique? Your description is typical for people that need to kick hard to keep their legs up, as the legs’ muscles consume a lot of oxygen. If this is your case, I’d suggest you have a look at our swimming lessons for the front crawl stroke. The first few swimming drills practiced in this lessons teach you horizontal balance, in other words how to stay horizontal without needing to kick hard. That should fix your problem with being out of breath after a single pool length.